Site Manager Glen opened up the pit gates, joined by regular volunteers Keith, John and Paul, followed by Chris, as the gang began work back-filling the now completed excavation at the rear of the winding engine house. After learning what we could from the levels there, and carefully covering the features in the former inspection pit, the filling began in earnest, as all eyes turned to the reconstruction of the site. The rear wall of the site, a 1920s rebuild with rubble in-fill, and some later concrete buttressing represents a real challenge for the Friends. A big job and no mistake. Facing it with the same determination as when entering the site in 2014, the group are committing to remove the ingrowing roots, lift the unstable stone blocks, and safely prepare the way to repairing the retaining wall. Drawing the larger pit excavation to a close allows us to focus on the bigger and more immediate challenge; hopefully making headway before the arrival of winter. Mind the gaps! The repairs to come. This was the same rain in January 1928 which flooded the Association’s electric pumps at the Elsecar New Colliery shaft at Distillery Side, and led to the temporary reinstatement of the running of the Newcomen-type pumping engine until hired submersible electric pumps could arrive. The threat of this modern collapse is not perhaps as great as it was in 1928, but still the Friends must make haste to repair the wall to safeguard it for the future. Just as with last winter’s campaign to repair the roof of the winding engine house, we will work with friends, volunteers and partners to clear away debris below, including the ingrowing tree stump, and to find the necessary skills to make good the repairs. The first step though was the hardest: in order to secure the partly-collapsed face of the retaining wall below, it would be necessary to remove what seemed – at first glance – to be solid brick and stone-work above it. As the old colliery switched from winning coal to pumping after 1920, and demolition continued in 1921, dressed stone blocks from elsewhere on site were used to create a pavement of sorts at the back of the winding engine house. 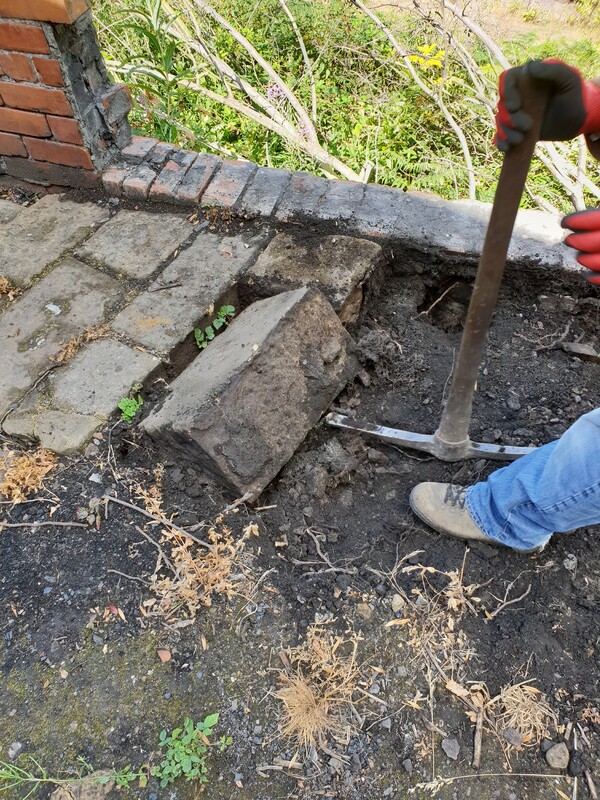 Part of this, nearest the wall appeared solid underfoot, but in fact had been undermined by the further erosion of rubble, so the first step was to lift the top blocks and reach a firm edge of rubble backfill from which repairs can safely be made. Ultimately, this will give the group a firm basis to restore the retaining wall line and put back the fallen stonework. Once the stone block flooring nearest the collapsed area was lifted, a steady flow of soil indicated that the brick wall immediately above the collapse was in fact ‘floating’ in the air; held in place by the compression on either side and the strength of the mortar. The group trod carefully; removing and stacking individual bricks at this point to ensure a clear working area for repairs. 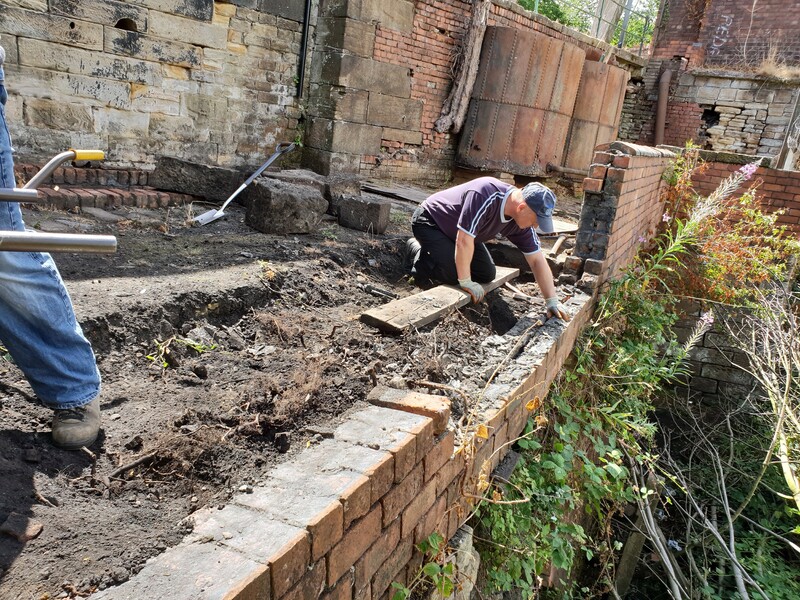 The first step on this particular project was definitely the hardest, as once the edge and tops of the remaining retaining wall and rubble embankment were reached it became much easier to target the bane of our work – huge tree roots. Getting across and under the root network of the tree which sits atop a concrete buttress is going to take a number of weeks, but this was a fine start to the challenge. 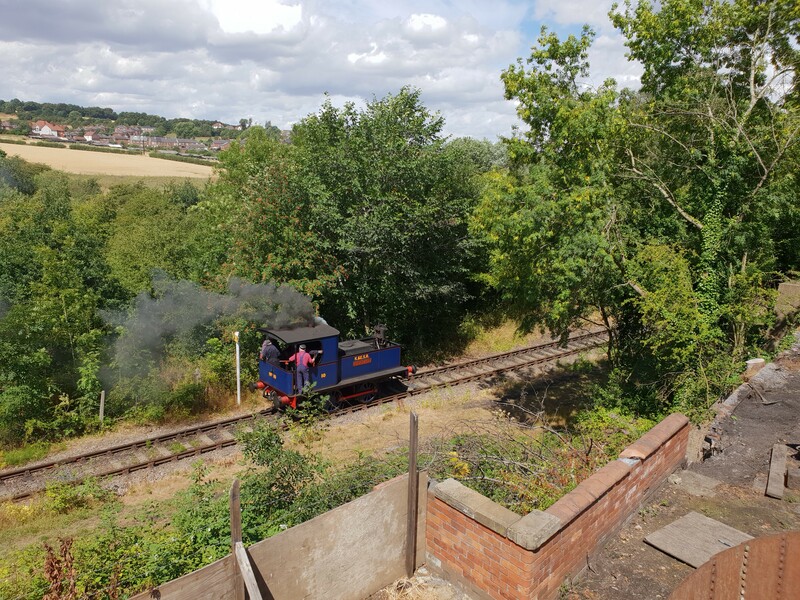 With all the Friends’ attention focused on getting to grips with the retaining wall, there was a most welcome distraction in the form of the steady back and forth of the Elsecar Heritage Railway. This weekend the Railway were visited by a large contingent of junior soldiers from Harrogate Army Foundation College, helping with the further work on the Cortonwood extension. By the end of the day their exertions mirrored our own! Wrapping up a very warm and busy day, the Summer sun and blue skies set a pretty picture for the volunteers on site. Hidden here and there though were other scenes of activity: nesting birds chirping away, hidden in the corners of arson-burnt out structures. In sharp contrast, an explosion of colour outdoors, with caterpillars swarming on flowering plants. Life and activity fill the site. Long may it continue!